I have great news! in my 6th attempt to print Magic:The Gathering EDH/Commander Art Deco Deck Box, designed by mitchel1682, I finally completed print! It's not perfect. I had to trim some pieces and sand down some edges, but it completed! 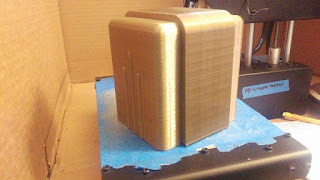 I printed it in the Antique Bronze filament from yesterday's review. 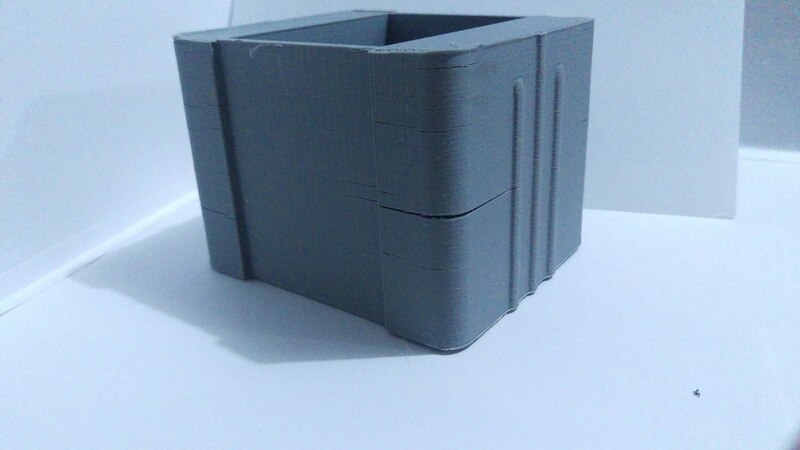 I finally got to print the lid! It fits! I was able to jam 100 sleeved MTG cards into it, but it wouldn't hold the commander too, which was a little unfortunate, i probably would have stretched it couple mm. Documented Attempt #1: ABS, cracked, horrible, gray ABS. My mistake in settings, which caused the print to last 39 hours, that actually stretched into something close to 45 hours, set me up for a horrible disappointment. Somewhere deep in hour 43 the printer stopper, built up a melted plastic bead, which attached to the extruder and yanked the very flimsy, fragile edge away. I watched in dismay, through my webcam setup and had to remote in to my computer to make sure the printer turned off and cooled down. It was a sad day, for sure. When I got home, I cleaned up a small amount of spaghetti, and hacked the edges off so that the print was nice an even... and I use it as a pen/garbage holder in my work area. I didn't have the heart to throw it away. In addition to my bed print setup, I also don't have the right environment for ABS, as you can see by the warping and cracking. Attempt #2: PLA, infill set to 100%, expectation for print. . 24 hours. I set up the print and walked away to make breakfast. came back and thought "24 hours is really high for how big this is..." and realized I could probably set the infill closer to 10%. I didn't take a picture, as it was only about 20 layers deep. 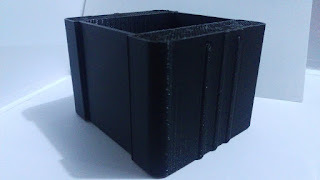 Attempt #3: Black PLA - I misjudged how much space I had and places something on the bed to compare how far along the print was. it caught on a screw, halting the movement of the bed, throwing my print off about an inch. I tried to use force to correct, but it didn't work. Attempt #4: Black PLA - Ran out of filament about halfway through. Prompting me to start measuring my prints and spools so i know exactly what is on each roll. Attempt #5. Bronze PLA, an issue I had noticed but wouldn't think of as destructive until this print. 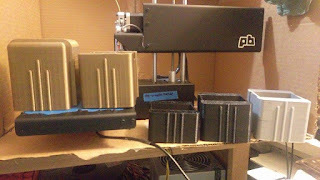 The control and power cords, wrapped in soft plastic, hangs down and to the left of the extruder. In the final hour of the print, the cord caught on the overhang and stopped the bed from moving, Causing the entire print to shift, as you can see in the picture. As you can imagine, this was very disheartening. I ended up snapping off the misprinted bits and throwing it in the bin with the rest of my misprints.Maybe it, too, will become a tool holder someday. 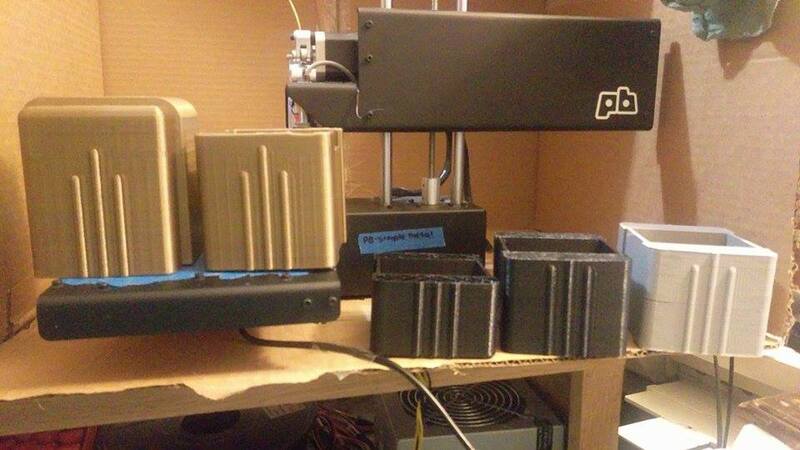 Not to mention the bronze filament is twice as expensive as the black or gray filaments, so I just wasted $6.50. To remedy the issue I ran into here, I used a zip tie to force the cord bundle a bit higher and behind the extruder, so as not to hit this snag again. Attempt #6: Perfection! Almost. 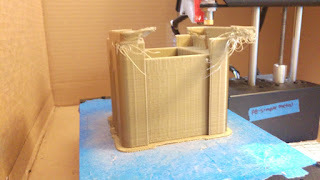 I didn't use any supports, so the overhang struggled and made me very, very nervous.there was an issue with some "spaghetti" stringing and looping into the print, which caused a couple, fixable issues. I used my cutting tools and sandpaper to smooth it out. I was also able to FINALLY print the lid. It was a little tight, but my sanding fixed the weird gaps and it fits perfectly!